Our gums shrink when they do not have teeth to support them. Normally, this occurs within the first three months of tooth loss and your dentures may need to be realigned to support your gum’s newly recessed area. 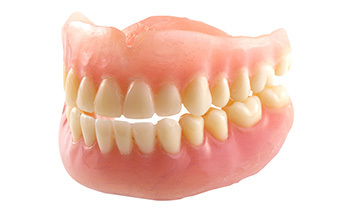 We also do denture repairs whether you’re in an emergency situation or just need your dentures fixed. What are relines and repairs? Relines and repairs are done when your dentures do not fit well in your mouth, become damaged or have succumbed to wear and tear after years of usage. We will realign your dentures so that they fit comfortably on your gums. In terms of repairs, we can restore a fractured or damaged denture to return it to its original condition. Dentures are quite fragile and require proper care to ensure that they remain in good shape. The difference between relines and repairs is that relines only deal with the fit of your dentures while repairs will alter the appearance (if they are cracked, broken or if a tooth has fallen out of them). We provide reline and repairs services for our patients because it means they can get more use of out their dentures and enjoy a healthy mouth. In order to reline your dentures, we will need to remove them from your mouth. We will then remove a layer from their surface. We will use a putty-like material to make an exact impression in the area of your mouth where the denture will go. After the impression has hardened, we will create a new surface base where the old layer once was for your existing denture teeth. We complete new surface creation in our lab and then return to you with your newly relined dentures once they are ready. Why are denture relines and repairs crucial to the overall process? Our mouths are in a constant but slow state of change. Over time the bones and tissues in our mouths shrink causing our dentures to become ill fitting. Dentures are supposed to fit tightly against the gum tissue which means that they will need to be relined every few years to ensure that they continue to conform to our ever changing mouths. Furthermore, because dentures are so fragile, they can accidentally fall on the floor and crack, which will render them unable to be used. Repairs will fix that. Because we are a mobile denture clinic, we will bring our denture reline and repair services to you. Contact us today for more information or to set up an appointment with our certified denturist. Whether you need your existing dentures repaired or are in need of a new set, we come to your home.